While at the workshop with Jane Dunnewold, I had the pleasure of meeting Robert Hillestad. He has been very active in the textile world for a long time and had a very successful career. He has been in more than 150 juried exhibitions, won many awards, and the Textile Gallery at the University of Nebraska is named after him. On top of all that is the fact that he is a great guy! He had an impromptu "trunk show" the last afternoon of our workshop where he strongly encouraged us to take as much as we wanted from his fabric stuffed car trunk. Along with the fabric was a box of cookie jars that he insisted I take home with me. Here is a picture of what I have done with three of them. 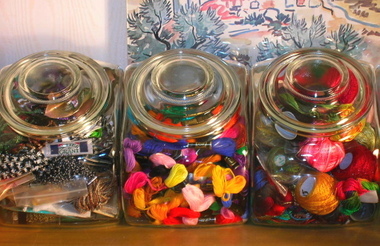 There are still a couple more jars awaiting assignment, but no doubt I'll have them filled in no time. Thank you Robert! This is so much nicer than the Tupperware that I was using for these things.